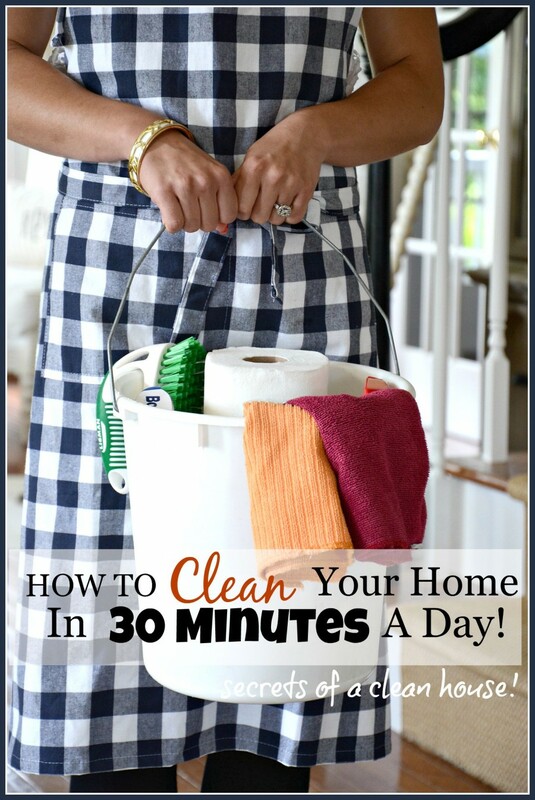 HOW TO CLEAN YOUR HOME IN 30 MINUTES A DAY!!!! Okay, I just need to say… I mostly hate cleaning. 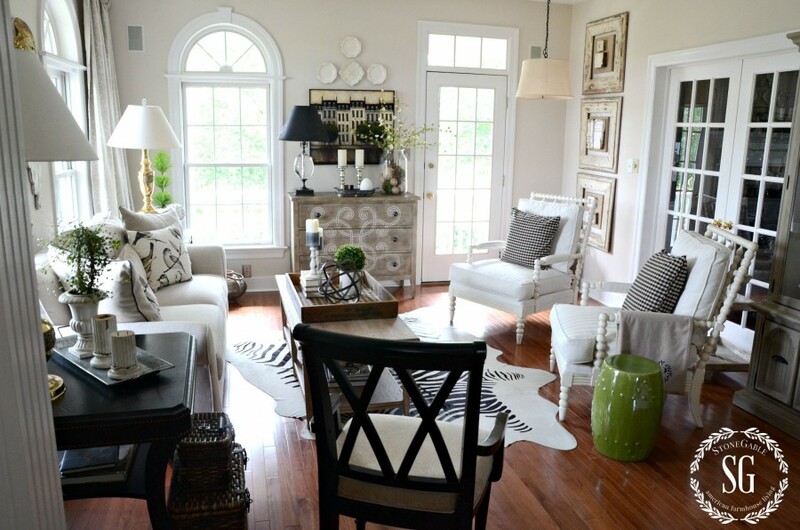 But I really hate a dirty house even more….and I love love love the idea of a clean and tidy home!!! I have been cleaning my home in 30 minutes a day for decades!!! It’s easier than you think to have a clean home if you have a plan and execute it daily or almost daily! It’s all about quick cleaning tips! I set a timer for 30 minutes and get to work and when the timer goes off I am done, done, done for the day! Here is my 30 minute quick cleaning checklist! I hope it will be your’s too! Before we begin let’s set up some expectations for 30 minute house cleaning! 30 minute cleaning is cleaning. It’s not organizing or picking up a weeks worth of stuff that has been lying around. That’s a totally different thing! 30 minute cleaning is not spring cleaning. We are not talking about flipping the mattresses in all the bedrooms and washing the inside and outside of the windows. That is deep cleaning. 30 minute cleaning does not include making your bed. Make it when you get out of bed every day! If you don’t make a habit of it… you should! 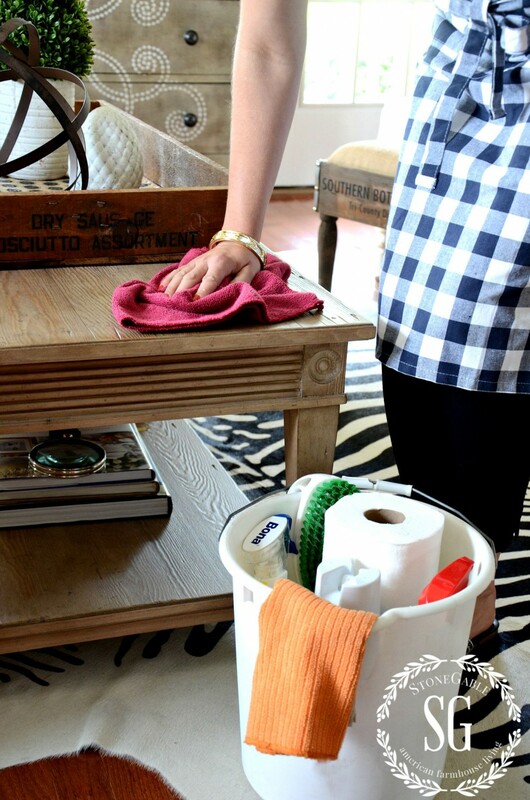 30 minute cleaning does not include weekly wet washing the kitchen and bathroom floors. 30 minute cleaning is done fast, fast, fast and efficiently… like an aerobic exercise! 30 minute cleaning is not perfect. Let’s be honest, nothing is! The first thing to do is get your cleaning arsenal together! 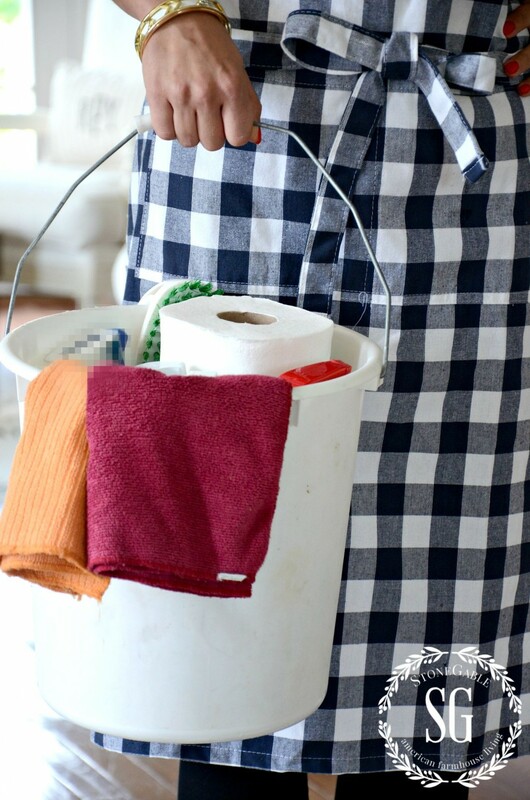 I use a plain old bucket and fill it with paper towels, a scrub brush, glass cleaner, multi surface cleaner, furniture polish, a wet cloth, a dusting cloth, a toothbrush (for cleaning dirt out of corners), plastic bags, timer and a feather duster. This is my cleaning tool box! Nothing fancy but very effective!!! 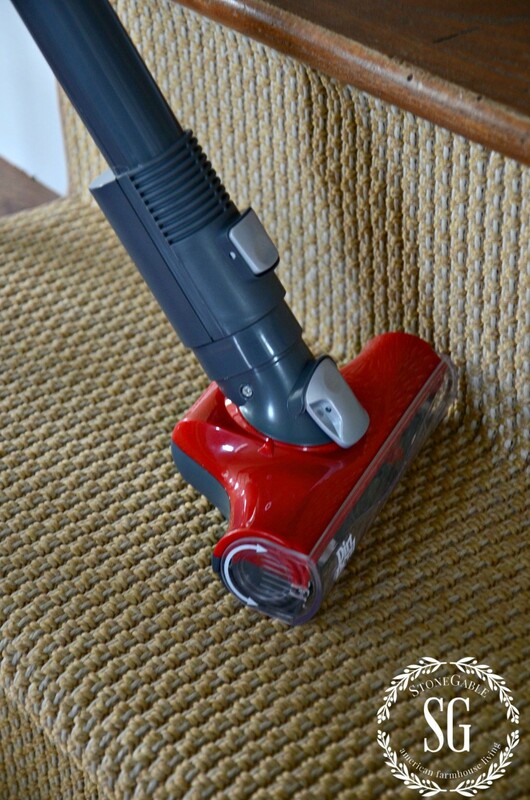 I also have a vacuum handy… I use the Dirt Devil 360 Reach! The bucket is kept in a closet so I can whisk it out every morning when I am ready to clean! It’s easy to carry from room to room as I clean! One day I clean the downstairs and the next I clean the upstairs! If I cannot finish the whole job on a certain floor I stop when the timer goes off and pick up where I left off on the next designated day for that floor! Easy and no pressure! Always start with the high areas of your rooms and work my way down… ceiling to floor! Using my feather duster I dust my chandy. I love a feather duster it collects lots of dust and can be easily shaken out! Wipe down half of my white kitchen cabinets (tops one time, bottoms the next time) with a multi surface spray and a paper towel.Wipe down 1 appliance surface also. Quick! Hitting the hight spots and any dirt. Wipe down all kitchen counters with multi surface spray and paper towels and clean out the sink. (don’t judge… I use paper towels. If that bothers you then have a couple of cleaning cloths on hand). Do not move things off the counters. Move them to the side, clean, and quickly move them back. 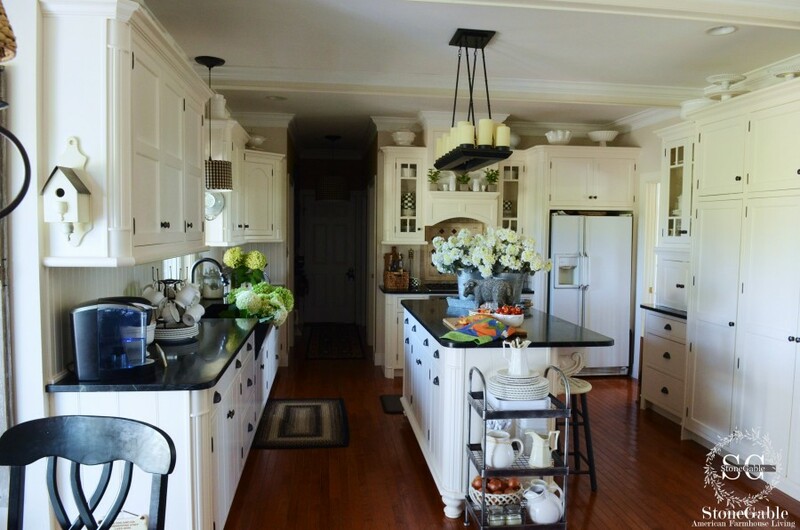 We clean the cooktop and stove after every use so it stays clean! It is not part of my daily 30 minute routine. Cleaning the oven hood is not part of my 30 minute cleaning routine. I clean it when I see it needs it when I clean the stove and cooktop. All of this takes less than 5 minutes! Don’t go crazy! Then I move to the breakfast room. Dust the bar and everything on it with a feather duster. This might take 3 minutes. Move fast and efficiently! Dust mirror with feather duster and clean off all smudges with glass cleaner and paper towels. Using the same paper towel clean the outside of the toilet and toilet seat. I also clean floor around the toilet with the same paper towel. Clean the toilet with a toilet brush. Now I move to the family room then the dining room, foyer and living room. Dust all surfaces with a feather duster. Start with the mirrors and work down. Zip around and get the dust off everything! 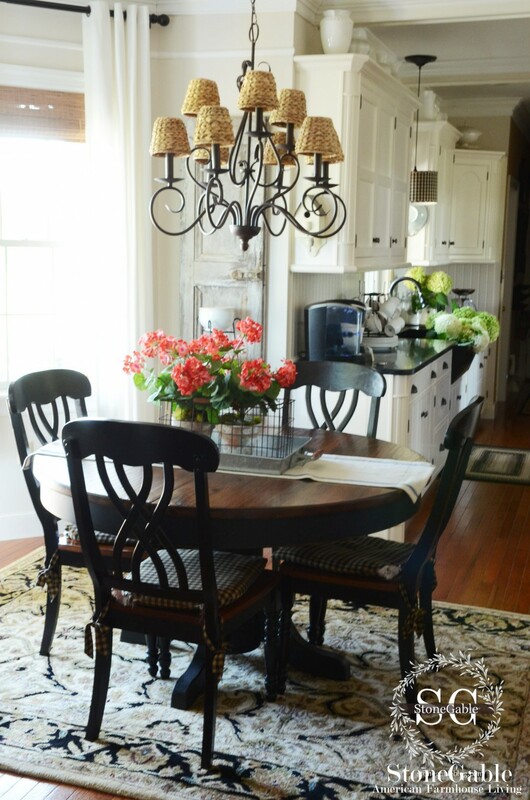 Use furniture polish and a soft cloth on large flat surfaces like the dining room table, coffee table, cabinets, end tables, etc., but work quickly!!!!! I don’t always use furniture polish. Often the feather duster or soft cloth is enough. Use a paper towel on any smudged glass surfaces, like a hutch. DO NOT use this time to clean your windows. That is for heavy cleaning! Remember move, move, move!!!! Clean all hard floor surfaces downstairs. Don’t over think or work it. Just do it!!! Clean and move on! Break a sweat!!! I tackle one bathroom each time I clean upstairs! And I clean them much like the powder rooms. All the cleaning products for cleaning the bathrooms are in each one! Spray the sink with bathroom cleaner. I DON’T CLEAN THE TUB BECAUSE IT GET’S CLEANED AFTER EVERY USE. Squirt bowl cleaner into the toilet but do not scrub out. 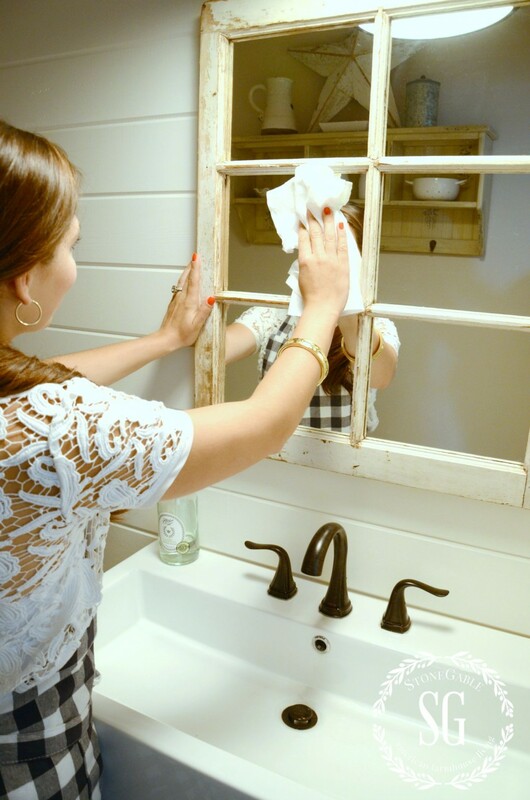 Dust the mirror with feather duster and clean off all smudges with glass cleaner and paper towels. Using the paper towel from cleaning the mirror, wipe out the sink. Dust floors with the Dirt Devil 360 Reach. Use furniture polish on a soft cloth on beds, dressers, night stands and all other wood pieces. Clean the tops and fronts and sides. I don’t use furniture polish every time I clean the bedrooms. A soft cloth often does the job. shake out all throw rugs onto the floor. Remember to keep a brisk pace when cleaning! We don’t want to take any longer than 30 minutes! When the timer goes off we are done until the next time we are scheduled for upstairs cleaning! Vacuum all carpeted areas. Vacuum like you mean it! 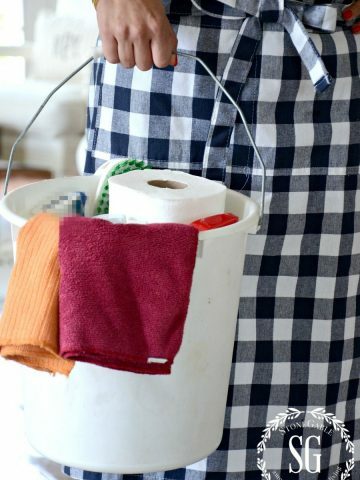 It’s important to make your cleaning routine as easy and simple as possible… and to customize it for your home! 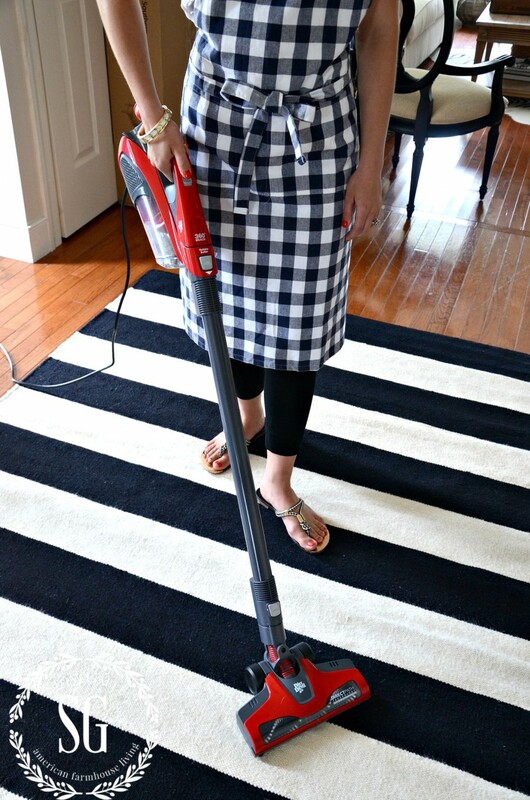 I hope you will give my 30 minute house cleaning a try! As you make it a habit it will get easier and you will get faster and more efficient! You home will also stay cleaner and you will have to do a big spring cleaning type cleaning less often! Remember to pin this to your Pinterest HOME or CLEANING or DIY boards. You can follow me on Pinterest and see all the new things I’m pinning every day HERE. HOW TO CLEAN YOUR HOME IN 30 MINUTES A DAY! You have a very pretty and informative site. You must have been a Flybaby at some point and adapted your routine to make it more personal for you. From the feather duster to “Swish and Swipe” (coined by Flylady, Marla Cilley) to using your timer and establishing routines. All tried and true FlyLady routines. You’re working it well! Your home is beautiful. Love your style! I was and am a Flybaby! But I’ve always used a timer to get work done! Thanks for making sure Marla gets the right credit! What is a Chandy ,please ? Chandelier… hope this clears things up! It should be easy but getting distracted sometimes (a lot of times) messes up my cleaning plans. I like the idea of the timer. A lot of your routine sounds very familiar,I clean in much the same way.I like keeping on top of things and cleaning in small increments keeps it from becoming an overwhelming chore. LOVE this article. Thank you for sharing with us!! 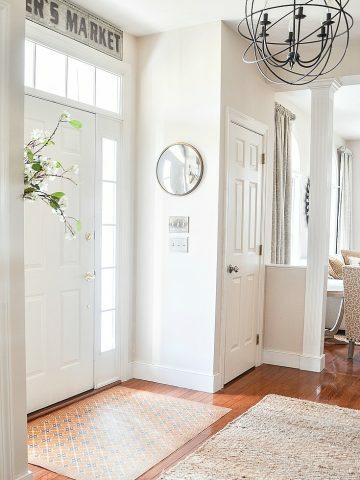 When you shake out your throw rugs onto the floor, where do you place them until you sweep the floor and put them back in place? I spray my tub or shower with Thieves by Young Living Oils. I also add some to my toilet and work on other parts of my bathroom. Then at the end of the cleaning I just wipe everything down. I do clean my shower or tub every time I use it and wipe my sink each day. Hope this helps. This sounds odd but I like to do cleaning! I’ve been using your method of cleaning forever! I’ve found that doing my heavier weekend- type cleaning on a Thursday evening (instead of Saturday, when I want to spend time with my husband or family) works better for me. It frees up Saturday and let’s the weekend be a relaxing time instead of one filled with housework. Just love the 30min cleaning. I can see that working in my home especially as it’s not a storey house. I have had surgery on my lower back and can’t go for more than half an hour. This regime will suit me so well. Thank you for sharing. Thanks for the great cleaning tips. 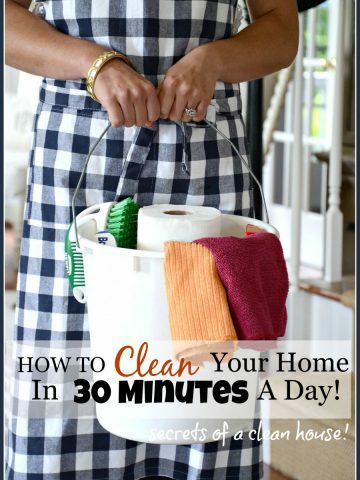 I especially love the 30 minute cleaning schedule, will really help me get done quickly! There’s no feeling like finishing your home cleaning & sitting back & enjoying the pease! Thank you for the great tips, I’m using them and not dreading or putting off cleaning anymore. Blessings. Just stumbling upon your website! How have I missed it?! Thanks for the great tips. I often get caught up in the little details when I try to do my own “quick” cleaning. Your tips will certainly help! Also, the 4 poster bed in your bedroom picture is fabulous! Could you share where I could find that piece, or one that resembles it? I will be trying these tips tomorrow for sure! Thank you! Just saw your post about the 4 poster bed. I have the same sitting in my garage since it did not work well when we downsized to a Lakehouse for retirement. I am located in Central Massachusetts just in case you are nearby and interested. Send me an email if you are interested. You don’t mention an office. How do you keep the paper etc. in control. Just keep cleaning room by room until the timer goes off and the next day start where you left off. I can usually clean my downstairs in 30 minutes because I speed along! Thanks, that’s what I thought, but yet wanted to clarify. Looking forward to this. Sounds very doable! Thank you, Yvonne! I am looking forward to trying this. (Can’t believe I’m looking forward to cleaning, lol. )I had been signed up for your blog for the longest time, changed my email address, and stopped receiving it. I missed your tips and enthusiasm! Blessings! Very good article….about cleaning 30 minutes a day……but, I only have two days to clean before Thanksgiving. I will be cleaning all day on Tuesday & part of Wednesday. Then the other part of Wednesday I will work on my menu for Thanksgiving. I get some very good ideas from your site, Yvonne. Thank you & Happy Thanksgiving. Wow! Such a real quick ideas. This made my cleaning easy and more organized. Found this thru a Pinterest link…even tho I follow your blog. Have to admit, I rolled my eyes at the feather duster. But as I thought about it I decided to give it a shot; after all I do have a cool ostrich duster that I bought in Kenya (from an ostrich ranch). Alright – you’ve changed my life! I can’t believe how quickly I get thru dusting now. Thanks Yvonne for the simple effective cleaning tips! I can spare 30 minutes a day to have a clean house!!!! I’ve also heard the debate on whether or not to make your bed right away! 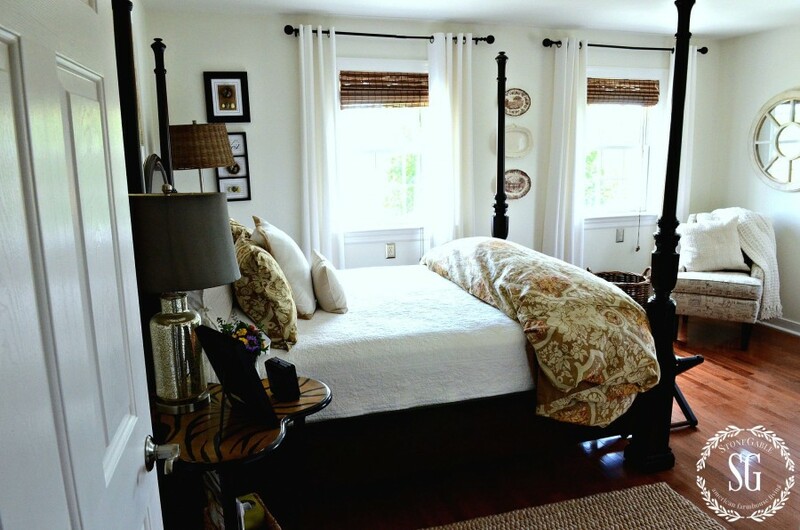 However, many years ago my dear Mom said “if you make your bed when it’s still warm, it will be a great day!” I still love those words and make my bed as soon as my hubby is out of it!!!! ? a simple vacuum system and get my cleaning bucket ready! No more dreading end of week cleaning, and our home will be so clean when company drops by!! Thanks!! This post is one of my favs! The first time I tried it I discovered having a time limit was key. It kept me moving from room to room and I got the job done FAST! Thanks for the 30 minute cleaning routine. I have to try since I hate spending my entire day cleaning. I am hoping this will motivate me by vreakingvitvinto small chunks. Yvonne, thanks so much for your blog, I love it and I love YOU! I set the timer for 30 minutes and also use the tv commercials, as one lady mentioned. What a great combination for me. Thank you for everything you do for us, my friend. YOu are so welcome! I hope my StoneGable readers have the cleanest houses of anyone! Yvonne, great tips as always. I use many of the same tips. Now I’m off to check out feather dusters and the Dirt Devil 360. Wow! Great informative Post.Its very helpful these tips save more time. Thanks for all the great tips.Keep posting & Sharing…. This is such a GREAT blog! Very informative! Austral Cleaning has the same cleaning process as you what have in this post. Thank you for this kind of blog! Thanks so much for the very nice compliment, Karen! I love this cleaning method. I will definitely try it. Unless, I missed it, you talked about vacuuming the floors, but you didn’t mention mopping the floors. I just had new hardwood put in and a travertine tile floor in the kitchen. I just wondered what kind of mop or cleaner you use. By the way, I absolutely love your blog. I use a 4 shelf cart with 4 trays that can come out, and that has wheels to pull from room to room that has all the items on it I may need. I even have a nail and screw case, hammer, electric screwdriver. If I need to get only a few things I pull out the tray I need. I only have a small home and the pantry is the only place to keep it and it’s a small one so the cart fits in there easy. All items you mentioned are on there also. Enjoy your posts. Thank you, thank you, thank you! I have read tons of articles with to do lists, schedules and more and they just don’t seem to work for me, my life is to busy and scattered! So I tried your suggestion this morning and WOW!!! My house is neat and tidy and I’m so excited. You have encouraged me to do this in the morning. 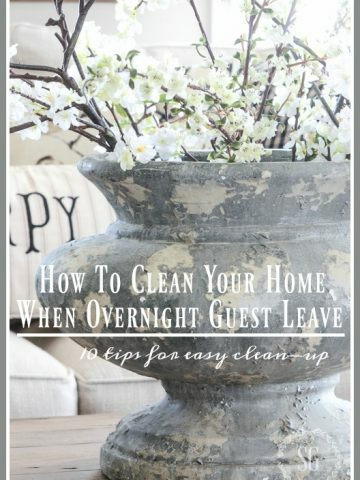 You see, I work at home so I put off cleaning and straightening and with this helpful tip, I’ll start this project in the morning as it is so simple and fast and in 45 minutes (I’ll work on the 30 minutes, promise, tee hee), clean and done! My husband saw me cleaning and did the dishes! Wow, everybody got in on the act. Thanks for the encouragement. Have a great day! God bless! Hello Yvonne, I was wondering what type of carpet you have on your stairs? I am looking to replace our stairway and hallway carpet, and the picture of carpet on your stairs looks very durable. Can you please let me know? Hi Sally, I got the carpet from Ethan Allen and their local carpet guy bound it and installed it for me. I WOULD NOT recommend it for the stairs. I love it but it is hard to clean and is unravelling in some areas. The carpet is really gorgeous, but probably not a good pick for the stairs. I’m hoping it will last for another few years so I can get my money out of it! Thank you so much for your response and for the warning. I guess I won’t be installing that beautiful carpet. Thanks so much for your great ideas, I never thought about breaking up the daunting task of cleaning into little increments, it is like anything else that is overwhelming take something big and put it in small amounts and then it doesn’t seem so insurmountable…… ? Love this, Yvonne! I try to do too much at one time. I just may try your 30 minutes cleaning. Sounds great to me. Until I saw the tiger table in the bedroom:D LOL! Oh where did you get such a sassy table, Yvonne? I love to clean ~ there’s nothing like the feeling of satisfaction you get when everything is all sparkly and in its place….that being said, my boys do not seem to appreciate my efforts 😉 so I do the best I can to keep things presentable for now. The Dirt Devil 360 seems to be so versatile that it’s a tool I’m definitely going to consider purchasing. Wonderful tips Yvonne! Tackling cleaning in little increments makes it much less daunting ! Ok, I ordered my Dirt Devil 360!!! You have totally inspired me! I used to clean like this, but working full time as a hospice nurse doing 10 hour shifts – well I was just too tired! But I have gone to half time & am looking forward to getting back in the groove! Thanks so much!! I received the dirt devil yesterday and gave it a spin. I loved how it cleaned out my window sills. When I put the extension on and tried cleaning my stairs, the nozzle swirled all over the place and I could get a good run unless i bent down and held it in place. Also, when I took my tools off the extension wand to feel the suction, it was hardly pulling anything in. I must have received a lemon. Does you vacuum have good suction with the long extension on it? Thanks. Great tips, Yvonne! I don’t like cleaning but your system breaks it down making it doable. Your daughter is an adorable model! I loved this post! You have inspired me. I am going this minute to put my cleaning bucket together. Thanks! I mostly hate cleaning, too. I do a pretty good job of keeping the house picked up, but cleaning…not so much. However, I am working on it. In fact, keeping a regular cleaning schedule is one of my home goals for 2015, and you’re 30 minute routine has inspired me. That dirt devil sounds so handy. I have wood, carpet and tile in my home, but feel like I shouldn’t use my vacuum on the wood. I’ll have to look into the dirt devil. I’ve been looking for a good furniture polish for a year. What do you use that works quickly without lots of buffing? Hi Pam! I really don’t have any particular brand I like more than another. Sorry! Great inspiration! And LOVE the apron! Well! You know my secret! I made myself a promise when I retied. No more rushing out the door at 7:00. I love my coffee and devotions followed by the Today Show and more coffee. I clean on commercials! I can dust my entire living room during a commercial. Next commercial brings out the vacuum! So it goes! Next commercial I tackle the dining room followed by floor. When I am done with the kitchen I turn on the TV in the bedroom and finish the entire upstairs. I make the bed as soon as my husband puts his feet on the floor. By the time the first two hours of the Today show are over I am in the shower and on the go or cleaning up the laundry room otherwise known as the home of the cats! If I could just teach those cats to clean ……… WOW! Great tips! I have a question. I’ve heard that making your bed as soon as you get up is not a good idea, that you should wait at least the time it takes to have a cup of coffee or get showered and dressed so that your not trapping moisture in. I’ve also heard for productivity you should do it right away as you said. Are both right? I’ve also heard both, to do immediately and to wait for a few minutes. I’ve also read that making your bed daily helps you start your day on a positive note and deters depression. Most beds, the linens and pillows make up 80% of our bedroom. So leaving your bedroom neat and tidy, for me, is a great way to start each day. If you’d like to air-out your bed, that sounds like a great idea. As long as you are disciplined enough to go back before starting your day. This blog has great tips. Great tips! Being a perfectionist, I tend to get too hung up on deep cleaning everything and keeping it perfect (which never happens with my family and then I get frustrated) so I need to change my mindset and try these suggestions. Thanks! Great, logical sequencing tips for housecleaning, Yvonne. Your model sure looks a lot better than I do when I clean, lol. I’ve used the handheld Dirt Devil for years, and have bought it for many newlyweds. They’re great for guys, too – garage & auto cleanup, so I suspect that 360 would be too. Their portability and suction are really awesome. Thank you for this post, Yvonne! 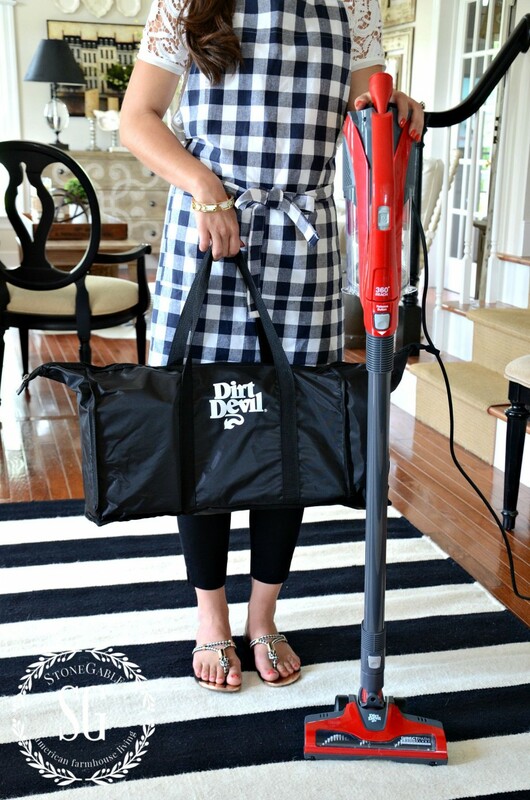 That Dirt Devil 360 is just what I need for cleaning my small upstairs, and I love the 30 minutes a day plan. Will absolutely do this! I just ordered my dirt devil on Amazon. They had a $10 off coupon so it was less than $100. Score. Thanks for posting. I’ve been looking for something that is light weight and has good suction. I looked up a couple of consumer reviews on YouTube and they all had positive things to say, especially that it had great suction power. I love your blog and style:) Thanks for taking the time to post. Thanks for the tip! I just ordered one from them as well. I had checked them out on several sites, and by far, Amazon had the best price. It also qualifies for free shipping and will arrive by Friday! Big Oopsie! It is NOT the same one. Comes without the power wand and carpet attachment. An expensive error for me! JustNanny – I also ordered mine from Amazon, it came today and mine has the power wand and carpet attachment….do you think yours might have been left out by mistake? Might be worth checking into that. You will be very happy with the Dirt Devil 360 Reach! Great Tips! I lost my feather duster — looks like I’ll have to get another one. Great tips! I should have read this BEFORE I just spent 3 hours cleaning!!!! But now I can keep up without the huge time investment! Chandy is short for Chandelier. Don’t you love when you learn something new? YOU go girl!!!! The pivot extension tool makes getting under and on top of things so so easy!!! Silly question. What kind of feather duster do you use that collects the dust and doesn’t just move it around? Do you use some product on the feather duster to make it more effective? A good ostrich feather duster really picks up the dust. When I am done I take it outside and give it a twirl between my hands and you can’t imagine the dust!!! I tend to get side tracked when cleaning a room so I need to stay focused and keep it simple…remembering this is just surface cleaning not deep cleaning. I’m going to check out that Dirt Devil. My new wood floors will be installed in about two weeks…this looks like an effective way to keep them clean. Thanks Yvonne, I can use your tips for sure as I tend to overthink the task and ultimately get stuck in one cleaning mode not accomplishing what all I set out to do. I am going to give this a try and get my bucket ready! Great tips here Yvonne….I used to somewhat use this method when I worked full-time. 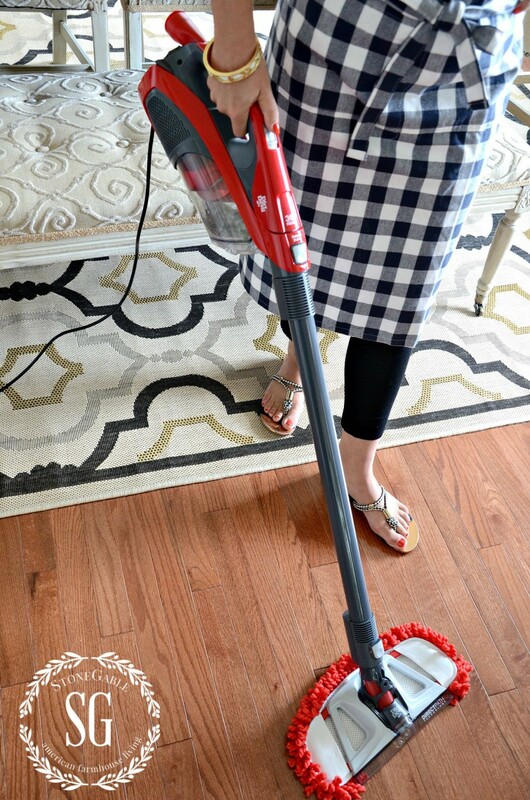 Made cleaning much easier when it came to the weekends…..The Dirt Devil is such a handy thing to have when you are doing the “30 minute” cleaning…so much better than dragging out that large vacuum cleaner!….and love your “cleaning model” !!! Have a great day and always enjoy your tips!!! Thanks! Jacquie was home for the weekend and we had fun doing this photo shoot. And she looks a whole lot better in an apron than I do! I am sure you look lovely in an apron too…your own kind of lovely! I am so inspired, thank you for sharing all this! Time to teach the kids these principles!! These are excellent tips! I don’t mind cleaning when I have the time, but lets be honest…who has the time really? Especially when we all work. I will admit I have a maid service who comes to my home and does a deep cleaning once a month. But I keep it clean the rest of the time. I have a routine very similar to this to keep things under control, that way it never gets out of hand so I don’t feel overwhelmed. I work full-time out of the home, and my husband works and sometimes travels, so I begged him to let me have someone help once a month. I still clean a little each day, which keeps things neat and tidy. I do the same thing with laundry, I keep up with it so it doesn’t get out of hand! That Dirt Devil looks really neat, I might look into one of those for quick clean ups! Thanks for the tips, I love a clean house but also love ideas to do it quicker and more efficiently.